Have any of your loved ones welcomed a precious baby this year? 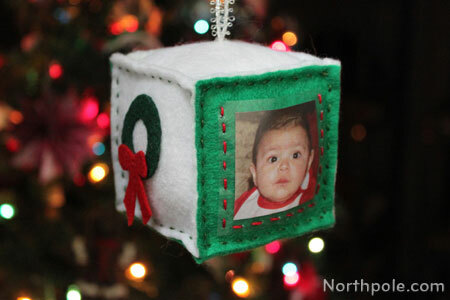 Then this little ornament—reminiscent of a baby block—will make a great handmade gift! 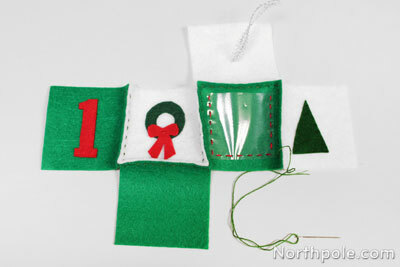 Make one for the tree or make many to spell out the baby’s name and use as nursery decor. Decide what color(s) you want to make the cube. Cut a total of six 3" x 3" felt squares. 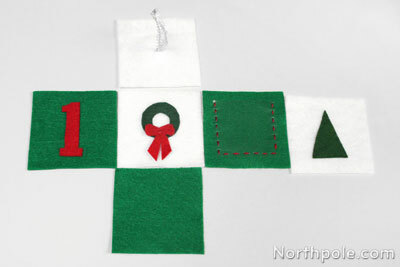 We are using white and green felt, so we cut three white squares and three green squares. Set aside. Note: You can use the square template to trace and cut out the felt squares, or you can cut using a rotary cutter and straightedge over a cutting mat. 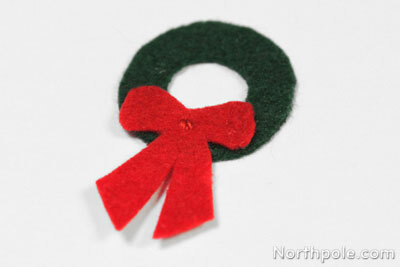 Place the wreath, bow, tree, and number one template pieces on felt (color of your choice), trace, and cut out. Sew the bow on the wreath. Sew the wreath on one of the white squares. Set aside. Note: We didn’t want the thread to be noticeable, so we used green thread (instead of embroidery floss) to sew the wreath. 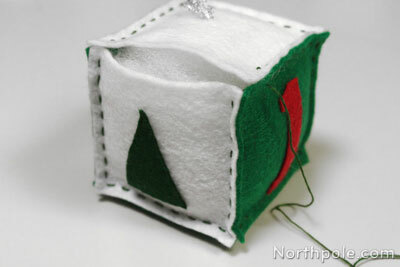 Sew the tree on one of the white squares. Set aside. 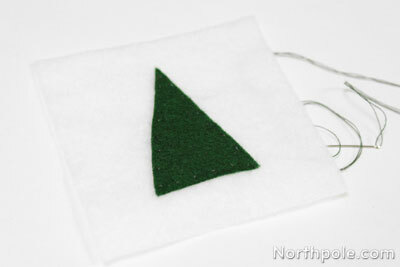 Note: Again, we used green thread (instead of embroidery floss) to sew the tree. 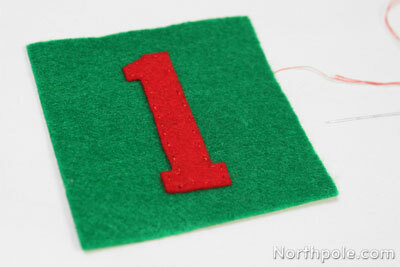 Sew the number 1 on one of the green squares. Set aside. Note: We used red thread (instead of embroidery floss) to sew the number. Measure and cut a 2" x 2" square from the sheet protector. 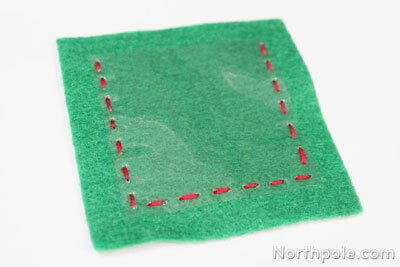 Place this square on a couple pieces of felt and poke holes along 3 sides, using the template as a guide. 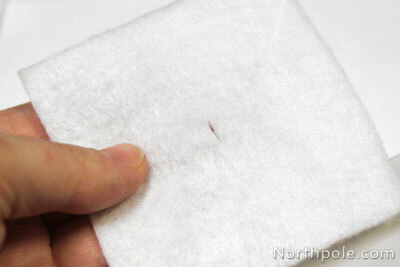 It’s important to pre-poke holes in the plastic to make it easier to sew onto the felt. Place the clear square in the middle of one green square. Use pins (or an extra needle) to keep it in place, poking them through the holes you pierced in step 9. 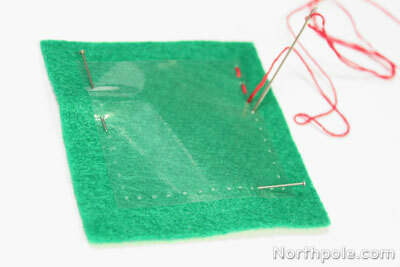 Using embroidery floss (see hints below), sew the clear square onto the green felt square. 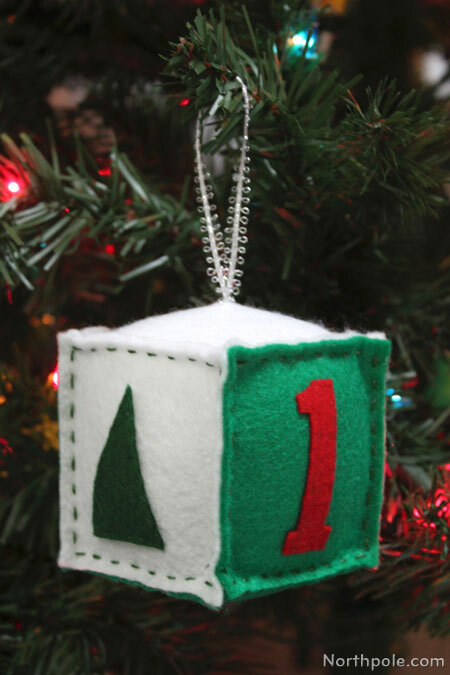 To make the ornament hanger, cut a piece of ribbon that is 6–7" long. 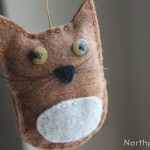 Then cut a small piece of felt that is a 1" circle or square. 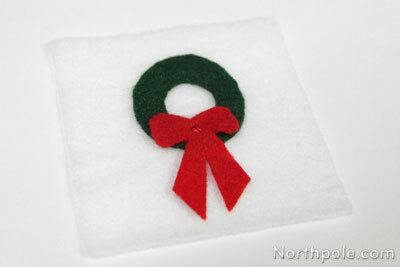 Cut a small slit in the middle of the white felt and stick the ends of the ribbon through. 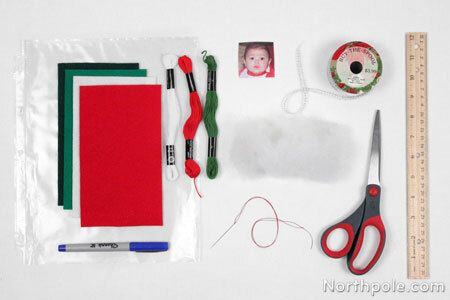 Sew or glue the ends of the ribbon to the felt. Take the last 3" x 3" white square and cut a tiny slit in the center. It’s hard to tell in the picture, but our slit is about 3/8" long. Push the ribbon through the slit in the 3" x 3" white square. Sew a couple stitches to hold it in place. Now, lay out the pieces in the order to be sewn. You can sew them together however you like, but see how we sewed these pieces together? We did it this way so we could sew with a continuous piece of embroidery floss. There’s no wrong way to sew you pieces together so long as they are facing the correct direction when your cube is finished! Then sew the bottom piece onto the cube. 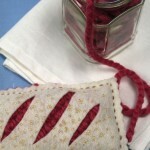 When you’re sewing near the corners, try to get good closure so there aren’t any big gaps. There’s no exact formula for this, just do the best you can, sewing over an existing stitch, if necessary. Begin sewing the top of the cube. When there’s only 1 or 2 sides left to sew, stuff the cube with Poly-Fil. Finish sewing, tie a knot in the thread and hide it. 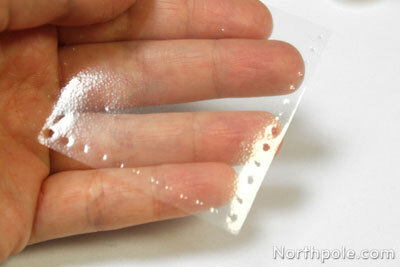 Cut your photo to a 1.5" square and slide it inside the clear pocket. Your ornament is now complete! 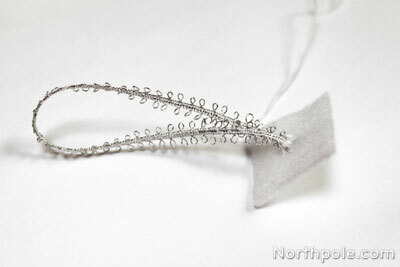 Just about every time we use embroidery floss, we separate the strand in half. 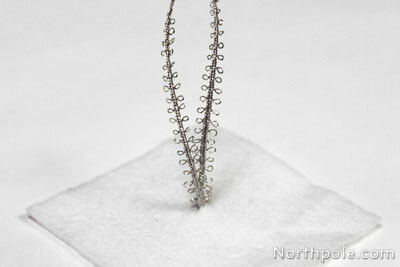 You’ll notice that a strand of embroidery thread is comprised of 6 threads. Separate it in half so you now have 2 strands of floss, each with 3 threads.